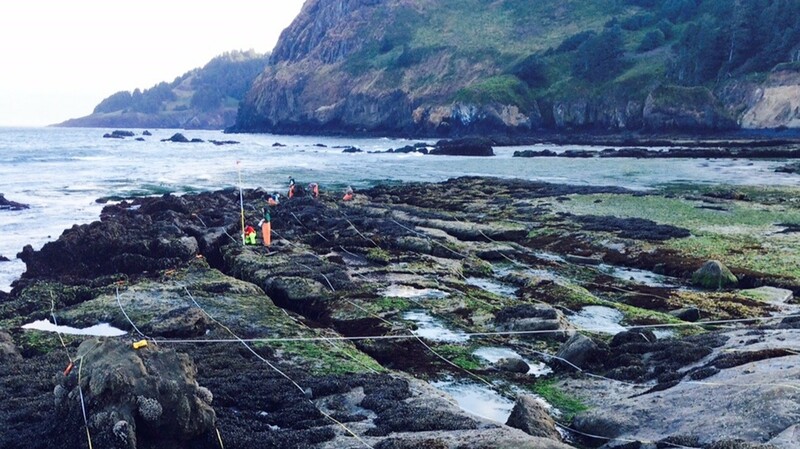 In the field last week scientists from the University of California Santa Cruz (UCSC), with help from the ODFW Marine Reserves Team, set up sampling plots to monitor rocky intertidal habitats at the Otter Rock and Cascade Head marine reserve sites. Rocky intertidal habitats are located in the intertidal zone, a narrow band of shoreline that is covered by water during high tides and then exposed at low tides. Marine organisms commonly found in this habitat include mussels, barnacles, sea stars, crabs, and many varieties of seaweeds. During a low tide, we laid out a large grid over the rocky habitat. We then proceeded to count the number of mobile invertebrates and the organisms attached to the rocks all along each grid line. During the surveys we also monitored for any signs of sea star wasting disease. These sampling plots will be surveyed over time, every 4-5 years, to evaluate any changes that occur to the biological community. The data collected at the Otter Rock and Cascade Head marine reserve sites join a dataset formed from over 100 intertidal sampling sites between Alaska and Mexico, surveyed by the MARINe/PISCO team based out of UCSC.